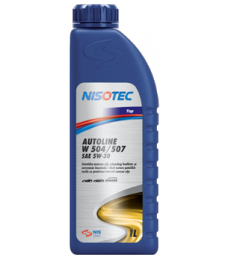 NISOTEC AUTOLINE W 504/507 SAE 5W-30 is a premium synthetic motor muti-grade “Low SAPS” oil of the new generation, primarily intended for lubrication of modern engines of passenger vehicles falling under Audi and Volkswagen Group (VW, Audi, Seat, Skoda). Recommended for all gasoline and diesel engines of passenger cars, primarily for those who meet the requirements of the standard in terms of emissions: diesel engines with a particulate filter (DPF) and exhaust gas recirculation (EGR), petrol engines with three way catalyst (TWC), VW diesel engines with direct injection models with a special pump-injector system. Guarantees long life and top performance for both the engine, and the exhaust gas treatment devices. High quality synthetic motor oil. Unique formula ensures exceptionally high performance, maximum power and engine protection in harsh operating conditions and at high temperatures, efficient and long service life of emission control system and better fuel economy. It is recommended for direct-injection and indirect-injection petrol and diesel engines, for turbocharged engines, for engines with injection pumps (TDI), as well as for computer controlled fuel injection and multi valve engines. It is also suitable for engines fitted with catalysts and diesel particulate filters (DPF). 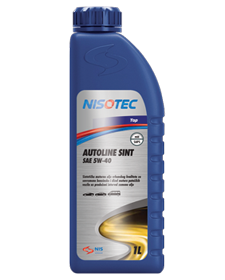 NISOTEC AUTOLINE SINT SAE 5W-40 is the ultimate synthetic muti-grade engine oil “Mid SAPS technology” intended for lubrication of engines of passenger vehicles and light commercial vehicles. Recommended for lubrication of modern fourstroke gasoline and diesel engines, including engines with turbocharging and with computer controlled fuel injection, as well as all modern multi-valve engines, engines with catalytic converters, vehicles with or without DPF, conforming to EURO 4 and 5 emissions standards and suitable for use in harsh climates. NISOTEC AUTOLINE PS SAE 10W-40 is a universal semi-synthetic multi-grade high-performance engine oil. Designed for passenger and light commercial vehicle engine lubrication. Specially designed for direct injection engine. Recommended for gasoline engines with or without catalyst and diesel engines with direct injection, multi-valve engines, with catalytic converters, with or without turbochargers. Ensures a highly-effective lubrication in both city and long-distance highway driving conditions. NISOTEC AUTOLINE SAE 15W-40 is a high-quality multi-grade, mineral base engine oil suitable for passenger and light commercial vehicle gasoline and diesel engine lubrication. Intended for lubrication of gasoline engines with or without catalytic converters and diesel engines with or without turbochargers. Ensures a highly-effective lubrication in both city and longdistance highway driving conditions. NISOTEC AUTOGAS SAE 15W-40 is a special high-quality multi-grade engine oil intended for passenger and light commercial vehicle LPG -liquid petroleum gas and diesel-fuelled engine lubrication. Special formulation enables exceptional cleaning power and engine protection against wear. NISOTEC LONG LIFE SAE 20W-60 is a multi-grade engine oil for lubrication of gasoline and diesel engines, with and without a catalyst, with and without turbochargers, for high-mileage and high-oil consumption passenger and light commercial vehicles. Optimum oil formulation guarantees good lubrication and reduced wear. NISOTEC MOTOR OIL SF SAE 15W-40 is a cost-effective, mineral multi-grade, engine oil intended for lubrication of four-stroke gasoline engines with recommended API SF/CC specification. Suitable for use in older design engines, operating in moderate operating and climate conditions.